All transactions are safe and secure with a reliable history in online purchasing behind each of our associates. Buy the Great Pumpkin Charlie Brown t-shirt to own Peanuts clothing and merchandise. Join Charlie Brown and Linus in the pumpkin patch as they wait for the Great Pumpkin to arrive. 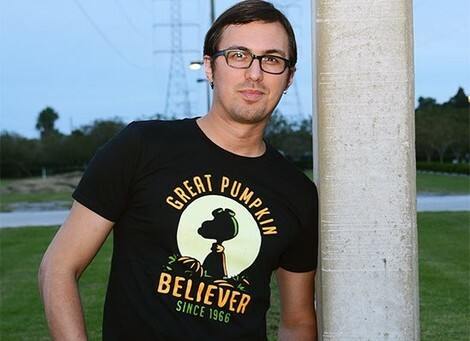 This festive Great Pumpkin Charlie Brown tee features a silhouette of Snoopy surrounded by the title, "Great Pumpkin Believer". You can wear it to your next for-real Halloween party. It's the perfect piece of clothing regardless of whether the Great Pumpkin comes to your pumpkin patch or not. If Halloween is not your holiday, check out our other great Charlie Brown t-shirts or Pigpen and Linus tees. In addition to the Great Pumpkin Charlie Brown tee above, browse the Peanuts Clothing Gallery for more apparel like men's and women's clothes, kids shirts or hoodies.